Discussion in 'Body Work & Detailing' started by PPro, December 28, 2004. 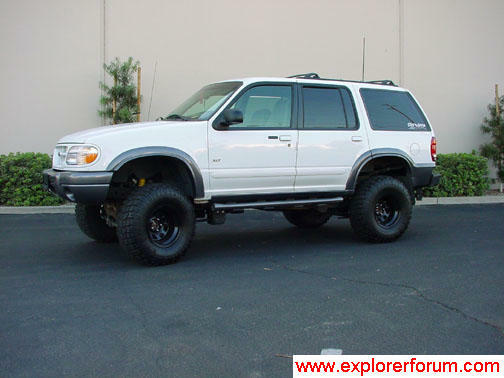 This isnt my explorer, but it looks just like mine. I am thinking about painting it, but would like to see what it would look like. Im horrible with photoshop, but I bet someone on here is pretty good. Could you guys make this X white w/ black wheel wells and trim? Oh, and with the front windows tinted? Thanks a lot, if you feel real generous, try all jet black and an offwhite 'cream' color w/ black accents. When I get home from work I'll mess with it a little. So I guess tomorrow will be when you get to see it since you're on the other side of the country. Here is a closest I could come up with LMAO! Sorry, haven't gone home since Monday night. As soon as I do I'll work on it. looks like my truck only mine is a sport.